So, somehow I thought I had written this review already. But apparently I did not. Maybe because subconsciously I was feeling guilty about my use of screens as baby-sitters of late. Over the past four months, we've moved 8 1/2 hours away from the only home my three boys have ever known. We've lived with family and friends, started a new school and new jobs. Transition has a way of wrecking hard-wrought schedules or forestalling good intentions. This is all a fancy way of confessing that sometimes I let my older boys play on pbskids.org or lego.com for 3 hours straight. Sometimes my 2-year-old watches his favorite episode of Curious George (the one with the mariachi band) three times in a row. And it keeps me sane for those hours... and it also makes my younger two boys super cranky and ungrateful when it's time to unplug. There. I've gotten that off my chest. 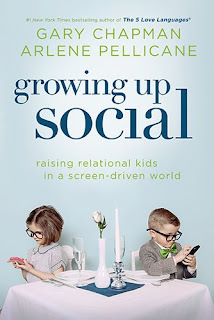 I knew I needed a book like Growing Up Social: Raising Relational Kids in a Screen-Driven World, co-authored by Alrene Pellicane and Gary Chapman of 5 Love Languages fame. I aspire to have children who play outside whenever its above freezing, who read books for fun, and who play together using their imaginations. I want my boys to value creativity and generosity and kindness over the accumulation of stuff. I feel like this book speaks to that longing. On the one hand, Growing Up Social is an easy read. Both authors, who take turns writing the various sections, are optimistic and encouraging storytellers of both cautionary tales to get readers on board with their message and of positive stories that give readers aspirations. There are loads of alliterative lists-- such as their A+ skills (Affection, Appreciation, Anger Management, Apology and Attention)-- and bullet point tips for not only preventing kids from becoming screen addicted, but also cultivating the character traits needed for healthy social interaction with friends, parents and other adults. On the other hand, it makes me realize that good parenting is hard work. Because Chapman is the co-author, ideas from the 5 Love Languages are sprinkled throughout the book. I'm a fan of this theory, that different people express and feel love through different means, such as physical touch, words of affirmation, gifts, acts of service and quality time. While I've considered these different ways of expressing love in my marriage, the mention of these Love Languages got me thinking about each of my boys' very different ways of feeling love. I think this is a key for filling up their hearts and lessen their craving for the mindless glow of screens. Don't expect an easy, quick-fix to your child's social handicaps or screen obsession, especially if you've been in the habit of allowing a lot of screen time- (which, in Chapman and Pellicane's view is over an hour or two each day depending on age). However, reading this book and prayerfully considering my children's actual needs-- for feeling loved and for training their character-- gives me a framework to consider my household screen culture. As a small example, if I notice that my son is begging for screen time while I'm staring at my smartphone, I quickly set it down and make eye contact and pull him close to see if he'd enjoy reading a book with me. I have a long way to go, but I feel this book helps me to see the mission of limiting screen time as less of a "should do" and more of a component to parenting socially healthy, happy children.